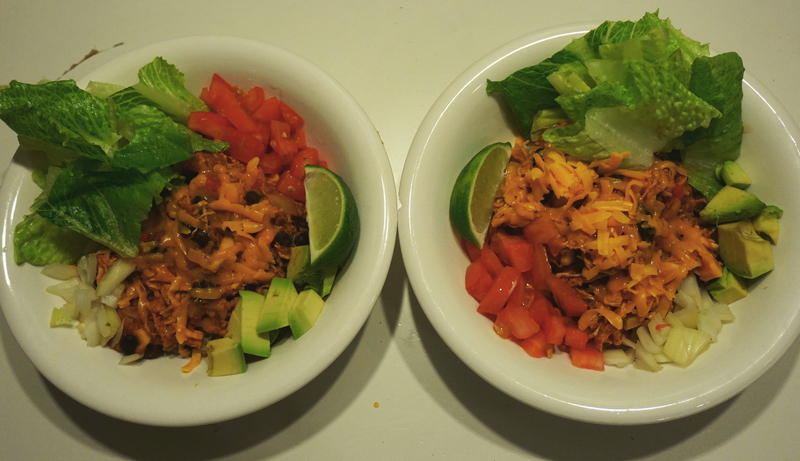 Better (on your) Budget Burrito Bowls – So… What Should We Make? I never realized how easy it was to make your own burrito bowl until it dawned to me that I was regularly spending way too much money at Red Burrito on campus. These are easily one of my staple lunches because they provide me with enough fuel to make it through a day of work, and because they’re bomb enough that I don’t get FOMO when my mind wanders to what restaurants exist just down the street from me. Another bonus is that you can make a bunch of the meat mixture ahead of time and freeze in individual portions for whenever you need a no-hassle lunch! As a reference point, the recipe I’ve written up below makes 8 servings (enough to feed my roommate and myself 4 times each), so you may want to adjust accordingly. My recipe calls for using a rotisserie chicken, which is significantly cheaper than using chicken breast, is easier to shred and saves a good amount of cooking time. It will be just as good if you want to use only breast meat, but you’ll need to size down on the proportions you use. 1/2 200 g can of chipotle peppers in adobo sauce (found in the ‘mexican foods’ aisle of most grocery stores – the brand I use is called ‘la costena’), You may want to use less depending on your spice tolerance! 1 680ml can of tomato sauce (tip: compare the sodium content between brands before buying!). You may want to have some extra on hand in case the mixture doesn’t end up being saucy enough for you/if you want to reduce the spice at any point. Shred the rotisserie chicken with your hands. Discard the skin and carcass. If you have a food processor, pour the entire can of adobo peppers in one and pulverize until it turns into a sauce. If you don’t have one, you can get away with chopping up the peppers very finely as long as you keep the liquid from the can and mix it back in once you’ve done so. Combine the tomato sauce, pulverized adobo peppers and barbecue sauce together. Taste to make sure you can tolerate the spice, and add more if you’d like. Once you’re happy, put it to the side.Place a large pan on a burner and turn the heat on to medium-high. Pour 2 tbsp olive oil and allow the oil to heat up. Once the oil begins to sizzle, throw in onions and allow to soften for 2 minutes. Add finely chopped garlic (or use a garlic press if you have one ) to the pan and turn the heat down to medium. Allow the garlic and onion to brown, but be careful that it doesn’t burn. 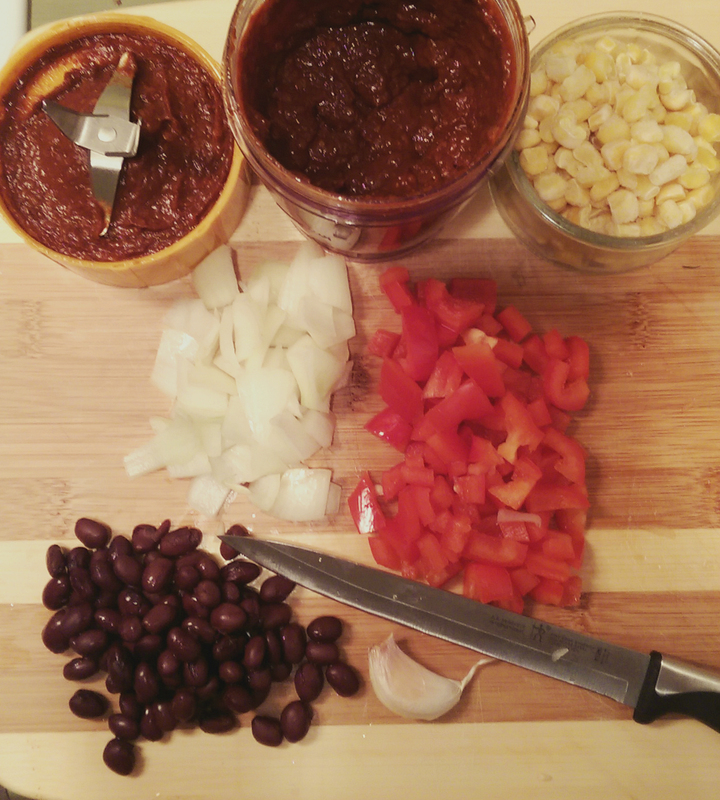 Add the shredded chicken, corn and black beans into the pan and combine the ingredients. Add the combined sauce into the pan, and allow it to heat up until the mixture bubbles, then turn down to medium-low. Do a taste test and add any other seasonings you may like. You can take this opportunity to cut out the heat if it is too much for you by adding more barbecue and/or tomato sauce. If you want more of a chipotle flavour coming through I recommend adding some of the tabasco chipotle hot sauce. Leave on medium-low for the next 5-10 minutes to allow the flavours to marry. Pour the chicken mixture over a bowl of brown rice. To easily elevate your rice you can add some lime zest, lime juice and cilantro – it really makes a noticeable difference. Sprinkle cheese on top and eat after adding the prepared ingredients below, or freeze individual portions of the rice, chicken mixture and sprinkled cheese. 9. After heating up the rice, chicken mixture and cheese together, add the above chopped ingredients and mix the entire contents of the bowl before you enjoy! Buy brown rice that is half-cooked already to save time in the kitchen – you’ll only need to cook your rice for 10 minutes, compared to 45+ minutes on uncooked brown rice. There are many boxed varieties at every grocery store, but make sure to check for the sodium content before you purchase one. I hope you enjoy these as much as I do. Let me know what you think!